Enjoy exhilarating hikes among the dramatic limestone mountains, jagged peaks and alpine meadows of the Dolomites' Sella Group, Val Gardena and Val di Fassa. This is a region that has its own distinct cultural traditions and a unique and tasty cuisine. The first three nights of your holiday are spent in the mountain village of Canazei, nestling in the shadow of the Dolomites. Canazei serves as a great base for climbers and hikers in the summer and is a ski resort in the winter.Your traditional mountain hotel has great views of the Sella and Marmolada mountain ranges. Its simple and cosy rooms have private bathroom facilities, a safe, hairdryer and television. Today's long and incredibly beautiful hike is amongst the striking, jagged limestone mountains of Sasso Piatto. To get to the start of the walk you can catch a local bus from Canazei to Campitello di Fassa and then take a cable car to the Col Rodella. A panoramic track leads you to the Rifugio Sasso Piatto, a mountain hut from where you have wonderful views of Sasso Piatto's jagged rocks and can stop to take a break. Continuing on to the Langkofel hut, you enter an almost surreal lunar landscape of limestone; sandwiched between the two giant peaks of Sasso Piatto on your right and Sasso Lungo on your left. You eventually descend steeply down to the valley station of the Sasso Lungo chair lift. You can either catch the chair lift part way down or walk all the way back to the Col Rodella on mostly gravel roads. You can expect today's 16.5 kilometre walk to take approximately six hours with a cumulative ascent of 810 metres and descent of 850 metres. Today you have two options: you can catch a local bus from Canazei to Vigo di Fassa and then a cable car to Ciampedie and start the walk here, or take a local bus to Pera di Fassa and then a bus from Pera di Fassa cable car to Rifugio Gardeccia and start walking from here. 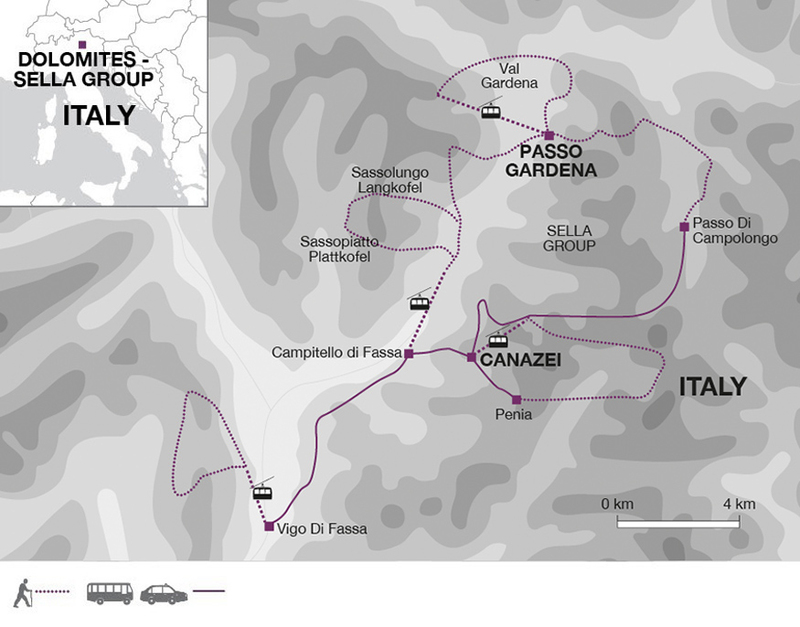 This circular walk takes you around the imposing Catinaccio group of mountains. You walk over tracks and gravel roads, passing Malga Vael and the Roda di Vael hut before starting to climb up to the Zigolade Pass (2549m). You then start your descent,flanking Forcella di Davoi and Cima Catinaccio with their jagged peaks. You pass the huts at Preuss and Gardeccia, where you may want to stop and reward yourself with a local snack before continuing back to your starting point. You can expect today's 14 kilometre walk to take approximately six hours with a cumulative ascent of 620 metres and descent of 650 metres. As on the second days walk, today's hike also starts from the Col Rodella which you can reach by cable car from Campitello di Fassa. Setting out on gravel roads and tracks you will have great views of the shattered limestone peaks of Sasso Piatto and Sasso Lungo on your left. Reaching the Sella Pass (2244m) you continue on with amazing views of the whole of the Sella Group on the right, beautiful and imposing. Finally you reach Passo Gardena where your accommodation for the next two nights is a cosy mountain lodge, or rifugio as they are called in Italy. You can expect today's 13 kilometre walk to take approximately five hours with a cumulative ascent of 440 metres and descent of 745 metres. You start the day with a cable car ride to Dantercepies. Walking through Selva you reach the entrance of the Puez Geisler National Park. You continue until you reach a charming chapel where a steep track takes you through lush forest. After about 2 kilometres you leave the forest and enter open rocky terrain - perfect conditions for spotting any wildlife. Then it about 3 kilometres to the pass where you can enjoy a stunning panoramic view. It's about an hours walk back to Passo Gardena. You can expect today's 7.5 kilometre walk to take approximately three-and-a-half hours with a cumulative ascent of 440 metres and descent of 745 metres. Today's hiking starts directly from the rifugio. From Passo Gardena the track ascends until you are walking pretty much under the massif of the Sella Group. In Val de Mesdi you cross a small river and the path goes down, sometimes quite steeply. When you're down in the valley you follow a gravel road until Crep de Sela. From there a steep track takes you finally to Ristorante Boe. From here you take a beautifull track that goes through spectacular rock formations. When you reach the Kaiser hut you only have to follow the gravel road until you're at the Passo Campolongo. A private taxi transfer will take you back from here to Canazei. You can expect today's 12.5 kilometre walk to take approximately five-and-a-half hours with a cumulative ascent of 755 metres and descent of 1020 metres. Today you walk along Via del Pan, the 'bread path' a nice route that runs along the southern side of the crest, offering amazing views of the Marmolada glacier and Sella mountain group. In the morning you can take a cable car from Canazei to Pecol and then another cable car to Col dei Rossi where the walking starts. You follow the 'bread path' to Penia from where you can catch a local bus back to Canazei. You can expect today's 16 kilometre walk to take approximately six hours with a cumulative ascent of 420 metres and descent of 1140 metres. The trip ends after breakfast in Canazei. We recommend taking lightweight and breathable clothing that can be layered according to the temperature and your level of activity. This should include a good quality waterproof jacket and trousers (e.g. Goretex / e-Vent), fleece jacket, comfortable walking trousers, shorts, warm hat and gloves, sunhat and sunglasses. Temperatures can change dramatically at altitude and at night. Take a pair of good, comfortable and broken in walking boots. Trainers and/or sandals for post-trek relaxation. You will need one main piece of baggage and a waterproof daypack sufficiently large to take spare layers of clothing, your water bottle, picnic and camera during each days walking (25-40 litres recommended). Your main luggage will be transferred to your next accommodation on days 4 and 6. Please clearly mark all your belongings with your name and the name of the next accommodation in order to indicate where the bags should go to next. Bags should be ready and at the reception or store room by 09:00 on the morning of your departure. You will need a water bottle (preferably 2 litres) and high factor sun cream. Trekking poles are recommended. Tap water is safe to drink at the hotel and rifugio, but water sources along the trail may not always be drinkable. We recommend you bring water purifying tablets if you intend to fill-up along the trail. Using tap or purified water rather than bottled water will help avoid creating plastic bottle waste. We recommend outbound and inbound flights to/from Innsbruck or Verona airports. Innsbruck is served by both budget airlines (EasyJet from Gatwick) and various charter flights from multiple airports in the UK. Verona is served by both budget airlines (EasyJet, Jet2, Flybe) and non-budget airlines (including British Airways). Your traditional mountain hotel in Canazei has great views of the Sella and Marmolada mountain ranges. Its simple and cosy rooms have private bathroom facilities, a safe, hairdryer and television.The mountain lodge (rifugio) at Passo Gardena offers simple yet comfortable accommodation where two people will be accommodated in a private room with attached bathroom. The rooms for 2 people have an 'Austrian style' double which is one very large double bed with 2 duvets. Due to the high demand for accommodation we are unable to offer a guaranteed single room on this holiday. The main airports you can fly to for the Dolomites are Innsbruck and Verona. From and to Innsbruck you can take a bus or a train to reach the city's central train station (see www.innsbruck-airport.com/en/train-bus/) and then get a train to Bolzano (to check timetables please visit www.trenitalia.it). From Bolzano take a bus to Canazei, changing in Vigo di Fassa. From and to Verona airport you can take a shuttle bus that runs every 20 minutes to and from the central train station (www.aeroportoverona.it/en/aerobus_t2). From Verona Porta Nuova railway station, take a train to Ora (please check timetables on www.trenitalia.it). From Ora there are buses to Canazei with a change in Cavalese. More detailed information on joining the trip and links to timetables will be provided in the Destination Manual sent to you once your booking is confirmedl. 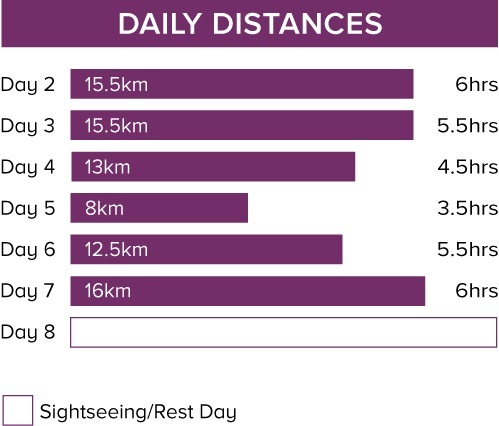 On this holiday you walk 80.5 km over 6 days (an average of almost 13.5 km a day). The route follows narrow gravel roads or well-marked hiking trails. On some occasions there are optional opportunities for climbing local peaks that can require some scrambling and are suitable only for experienced mountain hikers. Sat 15 Jun 2019 - Mon 8 Jul 2019 Your trip can depart anytime between the above dates. Contact us for triple room requests and solo traveller prices. Tue 9 Jul 2019 - Tue 23 Jul 2019 Your trip can depart anytime between the above dates. Contact us for triple room requests and solo traveller prices. Wed 24 Jul 2019 - Tue 30 Jul 2019 Your trip can depart anytime between the above dates. Contact us for triple room requests and solo traveller prices. Wed 31 Jul 2019 - Mon 26 Aug 2019 Your trip can depart anytime between the above dates. Contact us for triple room requests and solo traveller prices. Tue 27 Aug 2019 - Sun 15 Sep 2019 Your trip can depart anytime between the above dates. Contact us for triple room requests and solo traveller prices.